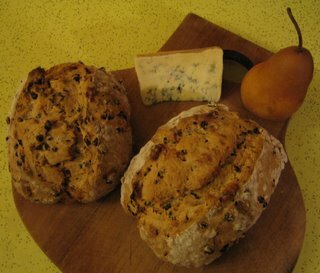 Irish soda bread with bosc pears,Cashel Blue Cheese, and a glass of Irish cider. This soda bread was inspired by Granny's recipe. 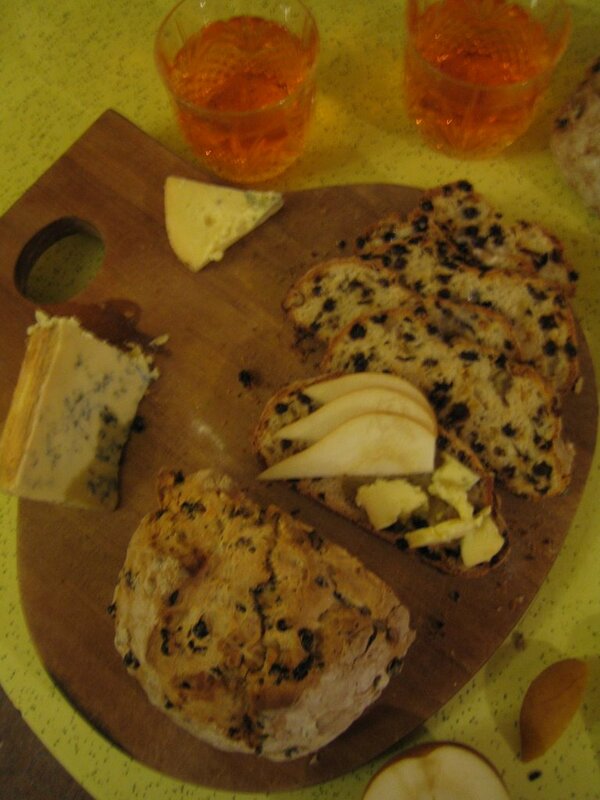 I added walnuts to the soda bread to compliment the cheese and pears. Preheat oven to 375 degrees F. Sift together the dry ingredients and knead together with the buttermilk, currants and walnuts until it just barely comes together. Cut dough in half and dust with flour while forming two oval laoves. Score the top of each loaf with an "x" and bake until golden and dry inside, about 45 minutes. This recipe is heavy on the currants, but there is no sugar. The currants provide the sweetness. There is no fat in this recipe. some recipes call for butter or shortening. I like to add butter or cheese to sliced soda bread just after it starts to cool off from the oven, but is still warm. There are no eggs in the dough either. Lee "Scratch" Perry would have prefered a good pint of Guinness with Granny's soda bread.